The WebSphere Solution Guide: WebSphere Application Server - Express, Version 5 was developed to help the marketing and support efforts for WebSphere Channels Enablement. 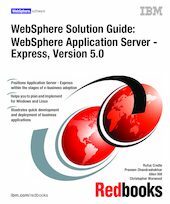 This IBM Redbooks publication represents one of two documents, together known as the Solution Guide for WebSphere Channel Enablement. The Solution Guide includes WebSphere channel-ready documentation in the form of a marketing and sales guide and an implementation and integration guide. The purpose of this implementation and integration guide is to simplify the planning and implementation of IBM Business Partners' and independent software vendors' e-business applications that are enabled for WebSphere Application Server - Express. It also takes into consideration the "Whole Product Concept", which incorporates everything the customer needs to achieve the business goals that drive its purchase decisions, including consultation, design, configuration, implementation, OEM products and services, and on-going support. In this book, we review and execute step-by-step instructions to set up and configure WebSphere Application Server - Express, Version 5 running Windows 2000 and Red Hat Linux 8.0. We also discuss how to successfully use the Application Server - Express wizard to create and customize a business application for your WebSphere Application Server - Express, Version 5 environment.